So it appears our senior officials have had their hands full today, with significant collaborations and deals made between Germany, Turkey and Afghanistan. However, let’s hope, given the deteriorating economic and security conditions, more than just “pledges of cooperation” follow these talks. Iqbal asserted that there is still a judicial crisis in the country, and maintained that “the issue was not about the number of judges, it was about deposed chief justice Iftikhar Muhammad Chaudhry, whose unconstitutional dismissal on March 9, 2007, sparked a movement for his restoration.” Iqbal emphasized, “The matter may be over for the president but for PML-N, lawyers, civil society and the media it is very much on top of national agenda.” Last Thursday, another figure in the opposition party, Raja Zafar ul-Haq further clarified that the PML-N had not dropped the judicial issue from their agenda, asserting “that no compromise will be made on the demand of terming the November 3 steps as unconstitutional and illegal,” reported GEO News. Given the current environment in Pakistan and the worsening economic and security crises, where on Pakistan’s list of priorities does the judiciary movement fall for you? I would assume that for the country’s lower classes who are more worried about their next meal than the independence of the judiciary, this issue is not even a priority. And for the people in Swat and Bajaur, who are increasingly forced to relocate due to the violence amid the intensifying military campaign, the judiciary movement may not even be on their radar. This is not to say the issue is not important or significant for the future of the country, or that it’s by any means “over” – but given the more immediate issues at hand, its temporary drop from the national agenda may be understandable. The continued American presence in the region, as well as the recent increase of missile attacks on militant targets on Pakistani soil, has caused anti-U.S. sentiment to increase dramatically. A recently released Gallup poll found that 45% of Pakistanis viewed the U.S. forces in Afghanistan as a menace to their country, [see related CHUP post]. On Monday, media outlets reported that yet another suspected U.S. attack struck the house of a Taliban commander in South Waziristan, killing up to 20 people, reported the Associated Press. 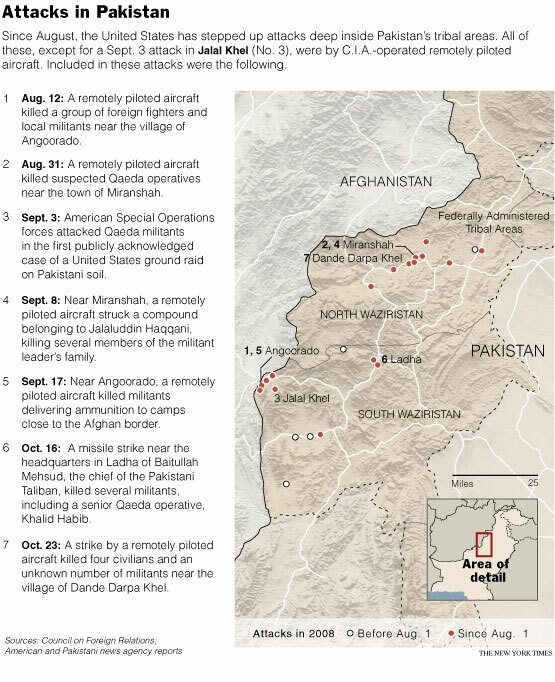 The NY Times has recorded that “through Sunday, there were at least 18 Predator strikes since the beginning of August, some deep inside Pakistan’s tribal areas, compared with 5 strikes during the first seven months of 2008,” [see NY Times image above]. The decision to focus on an intensified Predator campaign, therefore, “appears to reflect dwindling options on the part of the White House for striking a blow against Al Qaeda in the Bush administration’s waning days.” The American ground mission known to have taken place in Pakistan was the Special Operations raid on September 3rd, “in which the roughly two dozen people killed included some civilians,” reported the Times. The raid drew outrage from Islamabad, with Pakistani national security adviser Mahmud Ali Durrani paying a surprise visit to Washington to register the government’s complaints in person. American officials say there has not been a commando operation since the previous attack. While such a development [the U.S. backing away from ground campaigns due to complaints from Islamabad] may be significant, the truth is that Predator strikes are increasing, and with greater intensity. And while Pakistani officials have reportedly made clear in public statements that they regard the Predator attacks “as a less objectionable violation of Pakistani sovereignty,” each strike still garners an outraged response from Pakistan’s public. It seems like we have been forced to accept the lesser of the two evils – but at what cost? Also good to note: The Associated Press did a brief, albeit overly simplified breakdown of the militant groups operating along the Afghan-Pak border. The “politically sensitive” program has been stalled for months by negotiations between the U.S. and Pakistani military. Although the AFP reported that the U.S. official “attributed the delay to difficulties in getting the facilities needed to conduct the training,” recent tensions between the U.S. and Pakistan may also have played a part. According to the Washington Post yesterday, “Zardari and the government of Prime Minister Yousaf Raza Gilani have been at pains to balance their support of U.S. objectives with a recognition of widespread Pakistani distrust of the United States — among the population as well as the political class.” Such distrust has been intensified with increasing U.S. air strikes on Pakistani soil. 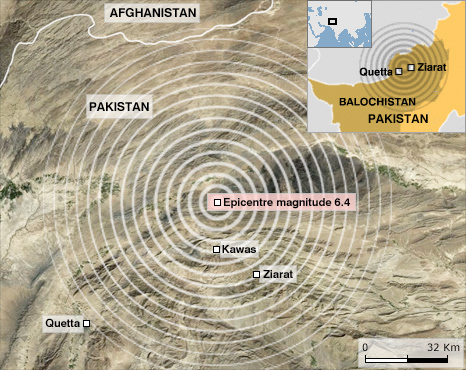 Just yesterday, news agencies reported that a U.S. missile attack hit a Pakistani madrassa [reportedly set up a Pakistani Taliban commander] in North Waziristan, killing eight students. The U.S. military training program has therefore been initiated within this atmosphere of distrust and increasing anti-American sentiment. In a recently released Gallup poll, 45% of Pakistanis said they viewed the U.S. forces in Afghanistan as a menace to their country. The fact that the program involves the U.S. indirectly training the Frontier Corps [via Pakistani Army officials] may indicate that the United States at least acknowledges this fact. The total area of the Indus Basin, the area draining the , Himalayan water into the Arabian Sea, is about 365,000 square miles (934,000 sq.km), larger than the Pakistan’s total area of 310,000 square miles (794,000 sq. km). Pakistan covers the major part of the Indus Basin (about 217,000 squares miles out of 365,000 square miles). The Indus River system consists mainly of the Indus River and its major eastern tributaries, the Jehlum, Chenab, Ravi, Beas and Sutlej Rivers. A number of relatively small rivers join the Indus on its west side. The largest is Kabul with its main tributary, the Swat River. The Indus and its tributaries easily make up the most important river system in the world. The basin was converted into an extensively cultivated area during the British colonial period, with millions of acres irrigated by large canals. At the time of Pakistan and India’s Partition in 1947, boundaries were drawn without first considering the realities of the region. The part of the Punjab to the west of this boundary become a part of Pakistan, while the east was incorporated into India. The immediate effect of this partition was that the Indus Basin became divided and conflicts subsequently arose between the two countries over the sharing of water resources. In 1948, after India obtained control of the headwaters and halted the water flow into Pakistan, the dispute drew international attention. In 1960, after years of negotiations, the World Bank brokered the Indus Water Treaty, [IWT] which regulated the use of the Indus Basin rivers. The agreement was signed on September 19, 1960 by Pakistan’s President Mohammad Ayub Khan, Indian Prime Minister Jawaharlal Nehru and the World Bank’s Mr. W. A.B Iliff. The IWT consists of three parts: the preamble, twelve articles and annexure A to H. The principal subjects covered in the treaty’s annexure are: the exchange of notes between the governments of India and Pakistan, India’s agricultural use of certain tributaries of the Ravi, India’s agricultural use of the upper reaches of the western rivers, India’s generation of hydroelectric power and the storage of water from the western rivers, a procedure to solve disputes and differences through a commission, a neutral court of arbitration, and allocation to Pakistan of some waters from the eastern rivers during the period of transition. The Treaty gave India exclusive use of the Ravi, Beas and Sutlej rivers. Pakistan was given access to the western rivers – the Indus, Jehlum and Chenab. Under the agreement, India has to allow these rivers to flow to Pakistan without any hindrance or interference, except as specifically allowed by the Treaty. This includes the use of water for domestic and other non-consumptive purposes, as well as the generation of hydroelectric power. However, the agreement precludes the building of any storage by India on the rivers allocated to Pakistan. For example, if India wanted to generate hydroelectric power it could only build run-of-the-river hydroelectric projects (unlike a dam or a reservoir), which does not create any storage [in the Treaty, Paragraph 2(c) (d) of Aricle III allows and Annexure C and D explains that how India can use the water of western rivers]. The Treaty established a Permanent Indus Commission, led by two high-ranking engineers, one from either country. The commission’s job is to monitor that neither country violates the treaty, and smooth out any differences that may arise. It can refer to either the World Bank [in the case of the Baghliar Dam dispute] or the Court of Arbitration for help in settling a conflict. The sources of the rivers are in India…and India had made arrangements to divert the waters…every factor was against us, the only sensible thing to do was to try and get a settlement; though it might be the second best, but if we did not we stood to lose everything. Although the Indus Water Treaty has survived hostilities between India and Pakistan over the years, recent developments threaten to undermine this agreement. On October 10, 2008, India inaugurated the controversial Baglihar hydro-electric dam project in Indian-administered Kashmir. Although India says the dam would be crucial for meeting the country’s power needs, it is located on the Chenab River [one of the western rivers given to Pakistan in the IWT], and is a clear violation of the 1960 agreement. Islamabad has claimed the dam would reduce the flow of water to Pakistan, depriving its agricultural regions of irrigation. Pakistani President Asif Ali Zardari recently told the Associated Press of Pakistan, “Pakistan would be paying a very high price for India’s move to block Pakistan’s water supply from the Chenab river,” adding that any violation of the Indus Water Treaty “would damage the bilateral ties the two countries had built over the years.” The question over the future of the IWT is a very serious issue and is only marginally addressed in the media. The sharing of the Indus River system is significant for Indian-Pakistani relations and disputes over this issue could further complicate tensions between the two countries.